Baby strollers for one or more children. Choose between strollers such as a pushchair, baby jogger, prams and combi strollers. There are prams with features such as adjustable backrest and handles, lockable front wheels and footrests. 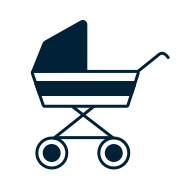 A shopping basket is handy for those who want to shop with the child, adjustable travel direction allows you to change the seat on the child, and washable upholstery makes it easier to keep the pram clean.